Reader Graham from the UK did a careful scan of the bill sported by our newly-arriving mallard hen. Comparing this year’s photos to last year’s photos of Honey, he seems convinced that it is the same duck. I’d sure like to believe that, but of course I am riddled with confirmation bias and must guard against my own wishes. Still, I think the chances are better than even that it is Honey. Last year’s dots have merged and faded but there is too much of a pattern match for it to be a coincidence. I’m 100% certain it’s Honey. Thanks to Graham for doing these analyses. This entry was written by whyevolutionistrue and posted on March 23, 2019 at 10:00 am and filed under ducks. Bookmark the permalink. Follow any comments here with the RSS feed for this post. Post a comment or leave a trackback: Trackback URL. Awesome work, I agree. I see the pattern, and how it might shift. A control experiment would be necessary to be convinced. I’m more convinced by the pattern at the back of the left side of the beak. But the dots toward the front of the left side are missing. The soap opera continues. Is it Honey, or is it Honey’s evil identical twin who tried to murder Honey with a blunt object to the head but instead Honey got amnesia and now her twin sister is taking over he life but 25 episodes from now Honey will lose her amnesia and come back and the police will take away her evil twin sister who will end up in an institution and be released 50 episodes later seeking revenge?!? Also, it turns out Honey’s mate is secretly a Mexican drug lord. James Pond? A Mexican drug lord?! Sign me up for this delightfully trashy, ducky drama. His real name is Santiago Rodrigo Rodriguez. You find out when he shows up with a villainous mustache. he shows up with a villainous mustache duckstache. Oh my Ceiling Cat, I can’t believe I missed that. You’ve made a fool of me! I certainly never meant to run afowl of you! Love the story so far! Hoping there will be more episodes to come. Surely someone has studied patterns in duck bills and how they change over time? 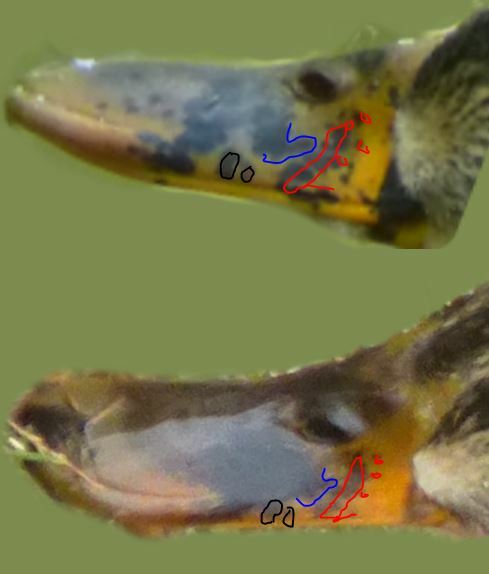 As posted years ago, it’s still the same issue: the key information is not in comparison of the supposed same duck, but of different ducks to see how similar beaks look like. For all I know all duck beaks could look identical, or they could be highly unique. I’ve done that, and I see no bill patterns that are even close to Honey’s. I’ve looked at a fair few mallard hen beaks on the Internet, too. Of course, if you want me to look at every duck in the world, that would take some time. This needs study. How much do the bill patterns of female mallards differ in the population, and in what ways? How do they change over time? Is there already any literature on this? (I don’t know of any.) This needs the same rigor applied to DNA tests of identity. There’s got to be a way of getting some money Templeton for this. Just send the Templeton Foundation a bill. Breaking news: PCC(E) will publish one last paper on the variability of duck bill patterns! Soon they will have smart phones with facial recognition for ducks. Then we will know. Is it possible that this year’s duck is one of Honey’s ducklings that inherited her bill pattern and came back to the pond it was born in? 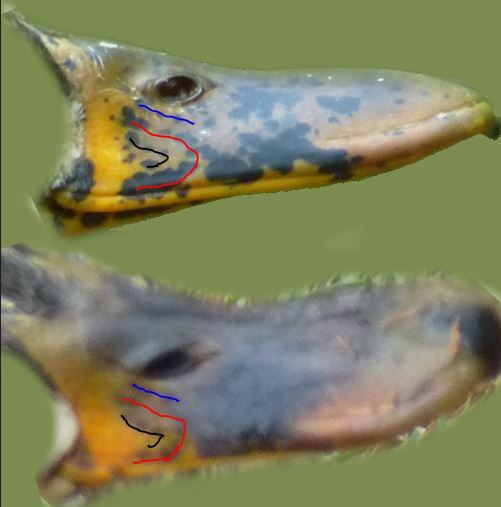 If the beak pattern can change so much in a year, perhaps there’s a better way of identifying individual ducks? Is this what the pros do? Are there pros? I wonder how ducks identify each other? People identify individual ducks by putting labels on them; leg and/or neck bands. Ducks probably identify individuals by voice. Of course but people are also undoubtedly sometimes in a situation where the duck is not labeled. Perhaps we need to work on a duck quack id system. I forgot to mention the other method: genetics. LOL. Evidently I needed to be more specific. How about non-invasive methods? On the other hand, perhaps our host could have identified Honey via DNA analysis of her poop. Still a bit expensive for that, I expect. I have some of Honey’s feathers that I collected last year! That might be a source of DNA and then I could compare them to feathers from this year. Of course, I’d need a duck DNA expert, and they’re probably contaminated, too. Is there a 40andMe site for ducks? You don’t need a duck DNA expert; anyone could do the extraction and sequencing. I’m not sure molted feathers would have enough DNA, though. You might talk to John Bates or Shannon Hackett. And I’m not sure what sequences would be good for identifying individuals. Maybe some microsatellite loci? Contamination might not be a problem. Recounting the numerous duck reports on this site, Botany Pond doesn’t seem to be a very famous place among mallards. Is is, apparently, mostly frequented by few regulars, what increases the probability that this lady actually is Honey. And if it’s not her, it is probably one of her daughters. But I’m confident it is her. You have to ring your ducks! I’m not convinced. Not only do the markings on Honey2 look different (only to me? ), but she did not respond to the Professor’s whistle. I refuse to believe she could forget you, Professor. It’s Honey or Honey’s doppelgänger. Give the duck a little time. There may be more signs to pick up on to help you tell. Yes, a statistics teacher once showed us how putting a line of any slope through a scatter plot of random points can fool the eye into detecting a correlation that doesn’t exist. I don’t know if that is happening here, but it is a possibility. Yes, but having looked at other mallard bills, these are pretty similar, I think. Honey’s bill, quacking, response to call, feed preference, feathers, returning to same location, etc… putting it all together should ID our friend. Wonder if her ducklings and/or Frank will return also. I say it’s Honey until another hen comes around and disproves it. Do you remember if last year Honey came to your whistle right away, or did it take a bit of time? I think you whistle-trained her 3-years ago. I whistle trained her two years ago, and, as I recall, she came to my whistle right when she showed up last year. This year neither she nor the drake did. But Honey’s behavior did change a lot last year over the season, with her getting a lot more skittish at the end. Lord knows what a duck encounters down on the bayou! Who knew ducks were so mysterious! The duck god, of course! Just like them, he moves in mysterious (in fact totally unducktecktible) ways. I remember that last year you also had doubts whether the duck was Honey – and she turned out to be. I agree. She looks like Honey to me. I also think the odds are long that another hen that looks so much like Honey would suddenly appear on Botany Pond. I think (disappointing for you perhaps Prof(E), it is one of her more savy daughters. However, that should be a source of delight as you get to enjoy duck grandchildren. I am not convinced after looking at the post and Mosieur Fisher’s collage but, who knows what aging does to a ducks bill. As a statistician, I am skeptical of 100% certainty. I, for one, would like to see the current scans compared with some negative controls. If it does turn out to be Honey get her tagged, I’m not sure we can take this level of suspense too much longer.